The GBC model 1033LA Corner Rounder cuts round corners with various radius with optional dies. Round corners help prevent "dog earing" and provide the extra enhancement step of professionals. Model #1033LA includes no dies. The GBC 1033LA Corner Rounder comes with a 90 Day Manufacturer Warranty. Welcome to MyBinding video. Let’s take a look at the GBC 1033LA Corner Rounder. 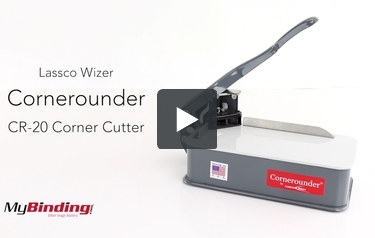 This is a great on the go with lightweight corner rounder. The 1033LA will prevent the inevitable dog earring of pages with its ability to create professionally rounded corners. This handy GBC tool is compatible of four different radius sizes – 1/8”, ¼”, 3/8” and ½”. Each die is sold separately and they are easily changed in and out. It has a ½ inch cutting capacity and is great for paper, cardstock and laminated materials. Corner rounding made simple by the GBC 1033LA. For more demos, reviews and how-to’s, check out MyBinding.com.